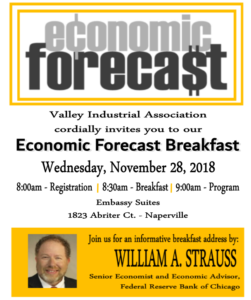 Bill Strauss, senior economist and economic advisor with the Federal Reserve Bank of Chicago spoke recently at the Valley Industrial Association’s annual economic breakfast. He addressed nearly 150 members and guests at the Embassy Suites Hotel in Naperville, discussing the major sectors of the economy and providing his economic outlook for 2019. During his presentation Mr. Strauss noted that the Federal Reserve believes the outlook for the U.S. economy is to expand at a pace above trend in 2018 and 2019 and close to trend in 2020. He also stated that employment is expected to rise moderately with the unemployment rate remaining very low. In addition, Mr. Strauss suggested that inflation is forecast to be at the Fed’s Inflation target through 2021 while housing is predicted to improve at a modest pace. He also noted that indicators point to manufacturing output to increase at a rate above trend in 2018 and rise at a somewhat slower pace in 2019. For additional information on our take on the regional and U.S. economies for 2019 and beyond, please reach out to a Dugan & Lopatka professional at (630) 665-4440 or info@duganlopatka.com.